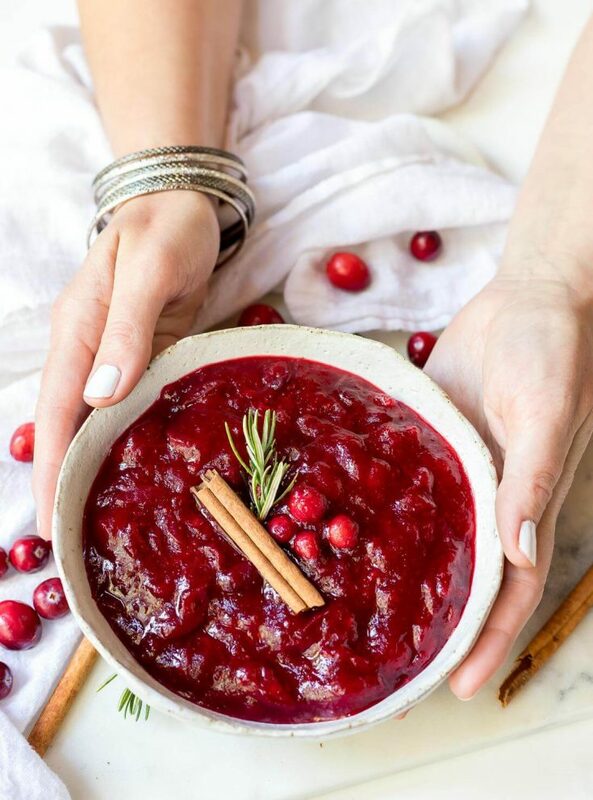 This Paleo Cranberry Sauce Recipe is a great way to enjoy your favorite Thanksgiving side dish without the refined sugar. The maple and cinnamon make this holiday side extra flavorful. This recipe is Paleo, vegan, dairy free and gluten free. This recipe post is in partnership with Rodelle. How do you make homemade cranberry sauce? 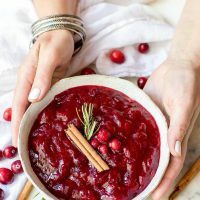 Cranberry sauce is one of my favorite Thanksgiving dishes to make from scratch because it is so, so easy AND the homemade version is much tastier than store bought. Plus, as with anything homemade, you choose the ingredients. 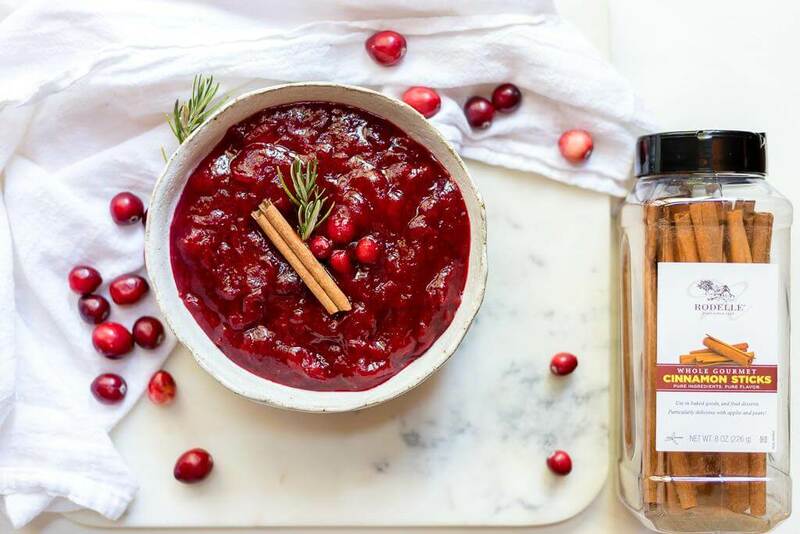 This Paleo Cranberry Sauce is made with fresh apple cider, maple syrup and Rodelle Cinnamon Sticks. The cider and maple syrup add the sweetness while the cinnamon brings a spicy warmth. Is cranberry sauce supposed to be served hot or cold? That is the great thing about homemade cran sauce, it tastes wonderful hot or cold. I personally enjoy it either way. The choice is yours. What do you eat cranberry sauce with? 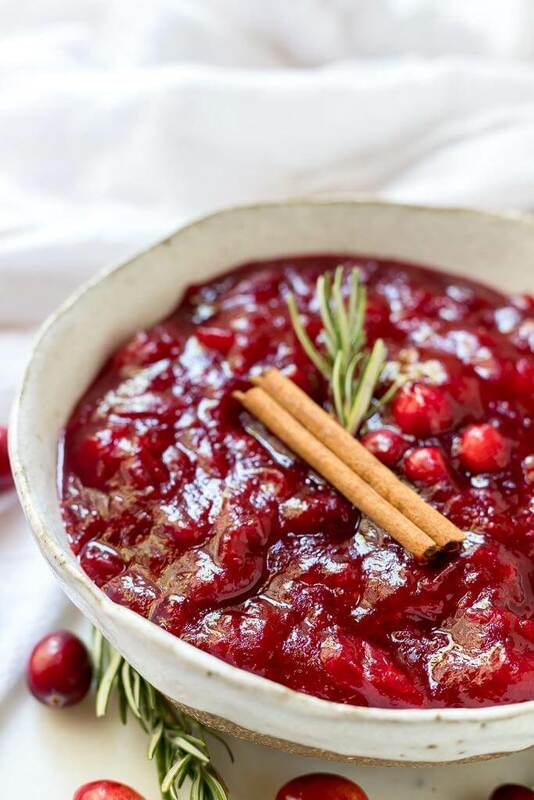 Cranberry sauce tastes great with turkey, chicken or ham. Here are a few recipes to get you going: Paleo Slow Cooker Turkey Breast, Easy Roast Chicken or Pineapple Honey Glazed Ham. How long will cranberry sauce last and can you freeze it? This should stay good in the refrigerator for at least a week. And yes, cranberry sauce freezes great! Just seal in a ziplock bag or airtight container and freeze for up to 3 months. You will need a 3 Quart Pot and a Blender or Hand Blender if you prefer smooth sauce. Wash cranberries and sort out any mushy ones. Transfer to a 3 quart pot and add cider, ginger, cinnamon and salt. Cover and cook on medium for 15 minutes, stirring occasionally. Reduce heat to medium/low, remove lid and mash cranberries (if preferred). Cook and stir until any excess liquid cooks off (2-3 minutes). Taste, it will be very tart. Add maple syrup to desired sweetness then cook while stirring for 2-3 more minutes or until sauce thickens again. Remove from heat and let cool before transferring to serving dish or container. If blending smooth, allow sauce to fully cool then blend to preferred consistency.